A transport protocol video and audio are transmitted is Websocket / TCP. Due to this, latency cannot be targeted to a specific value, and still can increase if any network fluctuations occur. With arrival of WebRTC, playing low latency video in iOS Safari 11 became identical to other browsers supporting WebRTC, namely Chrome, Firefox, Edge. Above, we said only about playing of real-time video. But you cannot run a video chat without a camera and a microphone. And this was a real headache for developers planning to add support for iOS Safari in their video chats or other live video projects. Thousands of manhours were wasted while searching for a solution in iOS Safari 9 and 10 that simply did not exist – Safari couldn’t capture the camera or the microphone, and this “feature” was fixed no sooner than in iOS 11. The browser asks for the camera and the microphone and now can both stream live video and play audio and video. Surely, there are specifics. The most notable feature is that the video in the video element must be tapped (clicked) before it starts to play. For developers, this is a limitation and a showstopper. Indeed, if a customer insists “I want this video to play automatically on load”, in iOS Safari this trick will not work, so the developer will have to explain that this is the fault of Safari and Apple’s F-ing security policy. For users, however, this may be good, because websites will not be able to play a video stream without explicit will of a user who confirms his will to play the video be clicking the element. Here are some good news for Macbook and Mac OS owners. After the update, Safari 11 on Mac also supports WebRTC. Previously, Mac Safari used old reliable Flash Player that did work as a cheap replacement for WebRTC: it compressed and played audio and video via RTMP and RTMFP. But now as WebRTC is available, there is no need to use Flash Player for video chats anymore. So, we use WebRTC for Safari 11+ and continue using Flash Player or WebRTC plugins as a fallback mechanism in Safari 10. As you can see, Safari 11 got support for WebRTC, while Safari 9 and 10 remained with fallbacks like Fash Player and WebRTC plugins on Mac OS, as well as WSPlayer on iOS. Now, let’s make tests for the main use cases. We start with a player. First of all, we need to install the latest iOS 11.0.2 with new Safari. So, as the first test, we want Chrome for Windows to broadcast a video stream to the server, and a spectator on iOS Safari should play this video stream via WebRTC. Latency is hardly visible (less than a second). The video stream plays smoothly and without artifacts. Quality of playback is good as you can see on the screenshots. And here is how video playback of the same example Two Way Streaming looks in the Play block. Therefore, you can broadcast one stream and play another one on the same page in the browser. If users know each other’s stream names, that’s a simple video chat. As we mentioned above, the main feature of WebRTC is its ability to capture the camera and the microphone in a browser and to send it to the network with a target low latency. Let’s see if it works in iOS Safari 11. Open in Safari the same example of the demo streamer we opened in Chrome. Receive access to “Microphone and camera”. Safari shows a dialog where you should either allow or disallow using the camera and the microphone. After we’ve got access to the camera and the microphone, we should see the red icon of the camera in the top left corner of the browser. Safari indicates the camera is active and is in use. The video stream is being sent to the server. We fetch this stream in another browser, for example, Chrome. On the playback, we see the stream sent from Safari with infamous vertical shooting. Video capturing and broadcasting of a video are always more interesting than mere playback, because the most important things happen here including RTCP feedbacks that set the target for latency and quality of the video. 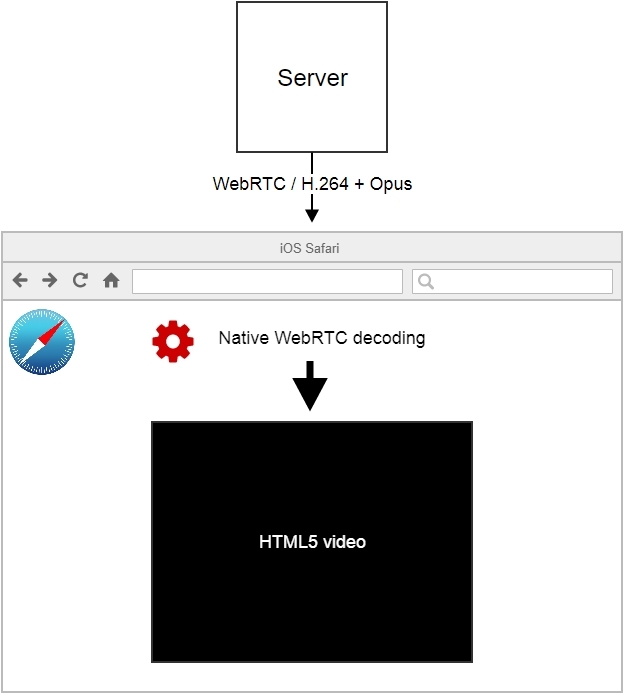 At the moment this article was written we didn’t find any suitable tools to monitor WebRTC in a browser for iOS Safari, like the webrtc-internals tool for Chrome. Let’s see how the server sees the video stream captured from Safari. To do this, we enable monitoring and take a look at the main graphs describing the traffic coming from Safari. The first set of graphs displays such metrics as NACK and PLI that indicate loss of UDP packets. For a normal quality network NACK shown on the graphs is considered low, near 15, so we can conclude the patient is well enough. FPS of the video stream stays near 29,30,31 and never goes down to lower values (10-15). This means that performance of hardware acceleration of iPhone is enough to encode the video to the H.264 codec, and the processor power is enough to stream this video to the network. For this test we used iPhone 6, 16 GB. The following graphs display how the resolution and bitrate of the video change over time. The video bitrate varies from 1.2 – 1.6 Mbps, and the resolution stays the same: 640×480. This means the bandwidth is sufficient to encode video and Safari compresses the video with the maximum bitrate. Optionally, you can put the bitrate in certain limits. Then we check the bitrate of the audio part of the stream and statistics of audio losses. We can see that there are no lost packets of audio, the counter is strictly zero. The audio bitrate is 30-34 kbps. This is the Opus codec Safari uses to compress the audio stream captured from the microphone. Finally, the last graphs are timecodes. Timecodes allow evaluating if video and audio are synchronized. Lack of synchronization leads to notable discrepancy: the voice lags the lips, or goes ahead the video. In our case the stream from Safari is ideally synchronized and goes monotonously without any deviations. From these graphs we can see behavior typical for WebRTC and very similar to the behavior of Google Chrome: NACK and PLI feedbacks comes, FPS changes only slightly, the bitrate is varying. 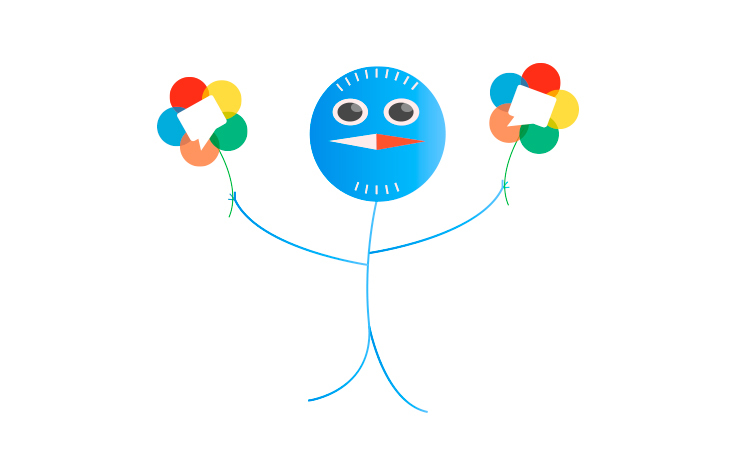 In other words, we’ve got the WebRTC we’ve been waiting for. Please note changes of width and height. For example, if we change orientation to horizontal, resolution of the stream reverses from 640×480 to 480×640, like shown below. The orange line here is the width, and the cyan line is the height of the image. At 05:21:17 we turned the iPhone that performs streaming horizontally and the resolution of the stream changed accordingly: width 480 and height 640. An IP-camera is usually a portable Linux server that sends streams via the RTSP protocol. In this test we fetch the video from the IP camera that supports H.264 and play this video in the iOS Safari browser via WebRTC. To do this, we enter the RTSP address of the stream instead of its name in the player we used before. In this case the video plays smoothly without any problems or glitches. However, the source of the stream has significant effect on playback. Depending on how the video goes from the IP-camera to the server, things can look different. to display the captured camera on the web page. That is, we set the name of the stream and specify the div-element to play this video in. Then, we call the play() method. iOS Safari is currently the only browser that requires clicking the element before the video starts playing. This code is executed in the standard player upon clicking the play button, so we fulfill Apple’s security requirements and correctly start playing the video. iOS 11 Safari has finally received support for WebRTC and this support isn’t going to be removed in further releases. So we can use this possibility to create real-time streaming video and browser calls. Install further iOS 11.x updates and wait for new fixes and bugs. Good streaming!